Responding to rhythm seems such an obvious and easy behavior. However, rhythm is connected to many important brain functions, including timing, which has shown to be critical in the effective coordination of mental as well as physical activity. SOUNDSORY® is specifically designed to emphasize the rhythm of music. The music has been specially crafted and selected to emphasize rhythm. Breathing, speaking, walking, reading, and even sleeping, our entire life is cadenced by rhythm. It is same for animals however; the conscious perception of rhythm is specific to human being. Clapping your hand based on musical rhythm seems simple but, in fact, is a very complex cognitive function. Whether it is dancing or just tapping one foot to the beat, we all experience how music can induce movement. We feel sounds as a movement experience, just as if we were moving ourselves. It is because the auditory function (the sensory organ) and the vestibular function (the motor organ) of the ear are interconnected that music can have an impact on posture, balance and coordination. It can trigger a sense of rhythm and make you feel like moving. In other words, the rhythm of the music is the link between the vestibular system and the auditory system and influences brain function and body organization. 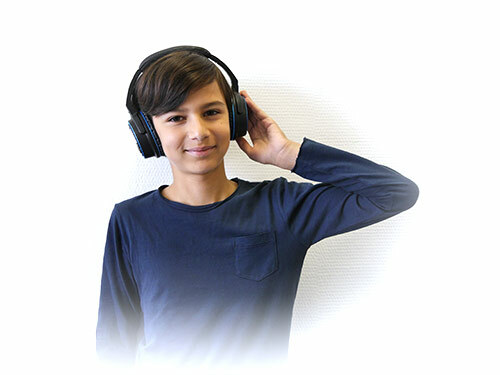 The music in SOUNDSORY® is specifically designed to emphasize rhythm, which is both easy enough for the brain to cope with and challenging and progressive enough to develop attention. The music has been crafted to focus on rhythms which are similar to our body-movement physiology such as March music. This unconsciously engages the full body. Each song lasts long enough for the brain to get used to the rhythm but is short enough to avoid habitual processing. Each day is organized so that specific tempos change several times in order to challenge the brain, which creates plasticity.